Disclaimer: Some of these routes pass through or under avalanche terrain and users should review the CBAC report and bring proper gear before venturing into avalanche terrain. Crested Butte is no doubt a mecca of mountain biking. It has been since the very first days of the sport. Sitting at 8,909 feet above sea level, surrounded by mountains that get an average of 217 inches of snowfall, it’s also a world-class ski destination. But if the menu is two wheels instead of two planks, what to do? Fat bikes are the answer. Of course fat biking is fun at any time in CB, but those wide tires really come into their own when Old Man Winter has blown on through. Coloradoans, and especially CB locals, are a hardy lot. They fully embrace snow. It’s a big reason they live there, so there are no shortages of places to ride when the trails turn white. There are two types of trails in the winter: user compacted and professionally groomed. Compacted trails could be from hikers/snowshoers, Nordic skiers, snow mobiles, etc., they’ll tend to be more rugged and possibly more difficult, but riders have a better chance of avoiding crowds. Groomed trails are perfect for beginners or those who just want to spin. Of course fat biking is fun at any time in CB, but those wide tires really come into their own when Old Man Winter has blown on through. Some of the best introductory fat biking trails can be found at the CB Nordic Trails. They are accessible right from town, incredibly scenic, completely free, and offer 8 miles of flat, easy trails, perfect for the first-time fat biker. Take the groomed Rec Path up from town and add more mileage. Once familiar with these trails, they serve as perfect links to ride out to the stuff farther out of town as well. Slate River Road , just north of CB, is popular during the winter with Nordic skiing, snowshoeing, snowmobiling, and access to backcountry skiing. Easily rideable from town, head three miles up the road to the trailhead, then head up to Pittsburg, a former 19th-century mining camp. The gentle climb is four miles long and is considered beginner to intermediate, depending on conditions. It’s an out-and-back that goes through breathtaking, postcard-worthy country. In the summer, Gothic Road is the way to get to CB’s most famous route, 401. During the cold months, it becomes a non-motorized playground, no snow cats, no snow mobiles. It’s unparalleled in its beauty, with leafless aspens lining the way and towering 12,000-foot snow-covered peaks all around. The best part? 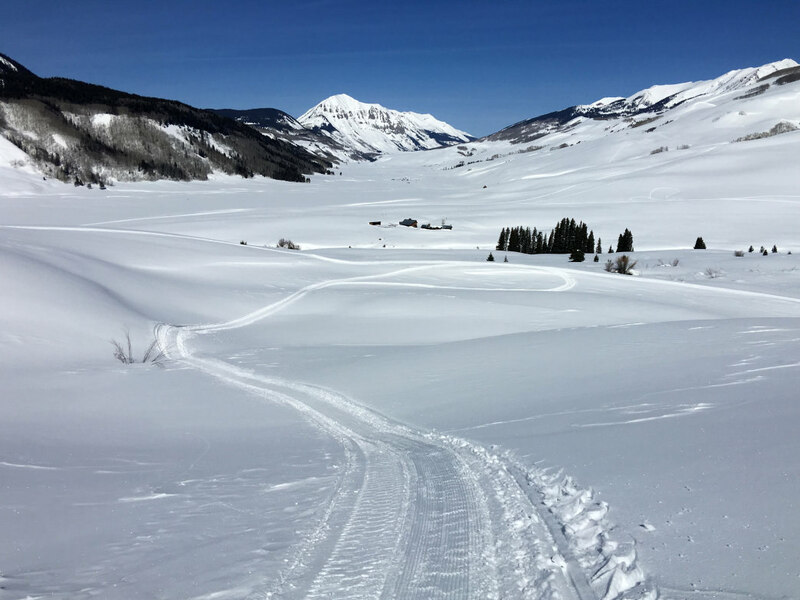 The Crested Butte Mountain Bike Association (CBMBA) has started grooming intermediate singletrack down to the former mining village. If starting from the obvious Snodgrass trailhead, it’s a 3-mile downhill. After the 6-mile out-and-back, if still feeling strong, hit the Snodgrass Trail. This 2.8-mile intermediate ride adds another hour and 2,000 feet of climbing to the day, but the downhill on the way back is certainly worth it. Find plenty of trails to explore near town. Another place to park for the Gothic Road/Snodgrass ride is at the** North Village**. This allows access to the above trails in addition to groomed, beginner-friendly corduroy bliss. There’s a 1.5 mile easy loop to start with, and if it’s before 9am or after 4:30pm, Crested Butte Mountain Resort (CBMR) allows uphill travel and cycling on specific routes. Some of the hills are super steep, but the routes are perfectly tamped down and the views unmatched. Riders will need to sign a waiver and have a pass to access the mountain proper. How about connecting all of them from town for one big day? Take the groomed Rec Path from the northeast corner of town all the way to the North Village. If it’s after hours, climb up CBMR’s front side, to hit Snodgrass and Gothic. It’s a 5-hour ride that’ll deserve some hot chocolate at the end! A few miles south of town is Brush Creek , another perfectly groomed area, courtesy of the CBMBA. Riders can actually take the CB Nordic trails out here to tack on more mileage. The bonus to Brush Creek is that the trails are cut in specifically for fat bikes. That means flowy, fun singletrack in the winter! The ride starts mellow and ends up behind Mt. Crested Butte for an almost 8-mile round trip. Visitors are treated with stellar views of Whiterock and Teocalli Mountains and Castle and Star Peaks. Be sure to pin the loop at Tent City. Depending on conditions, CBMBA has started grooming the Canal Trail and a loop on the Lower Strand Bonus too. In the summer, these are the trails that riders want to end their rides on because they are so unforgettably good. 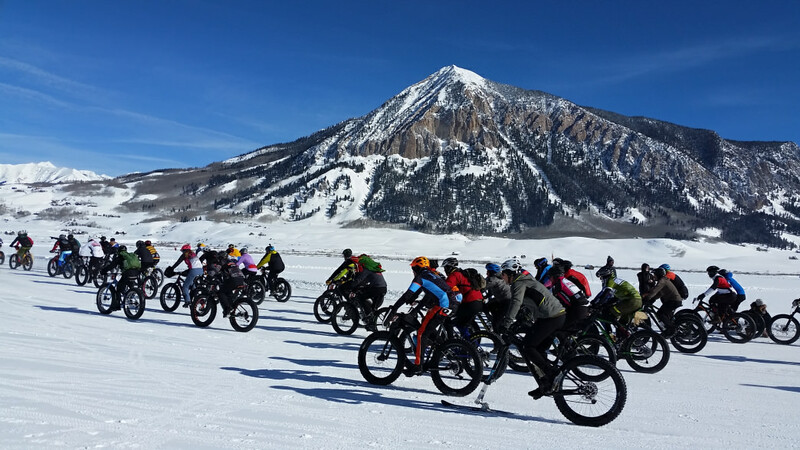 Crested Butte is the proud home of the Fat Bike World Championships. Also south of town is Cement Creek. It’s groomed at 10 feet wide and sees all manners of winter travel from skiers to dog walkers to snow machines. It’s not the place to go for solitude, but it does provide about 9 miles of beginner-friendly riding to the area. And the ride is lovely, gliding through deep pine forests, alongside cliffs, and near creeks as tires crush snow underneath. There is talk of grooming up even farther on Hunter Creek Trail, which would add another eight miles to the mix. Park, check on conditions, and get the latest info at Camp 4 Coffee. The owner, Al, is the one responsible for the excellent maintenance. Be sure to give him a big thanks! 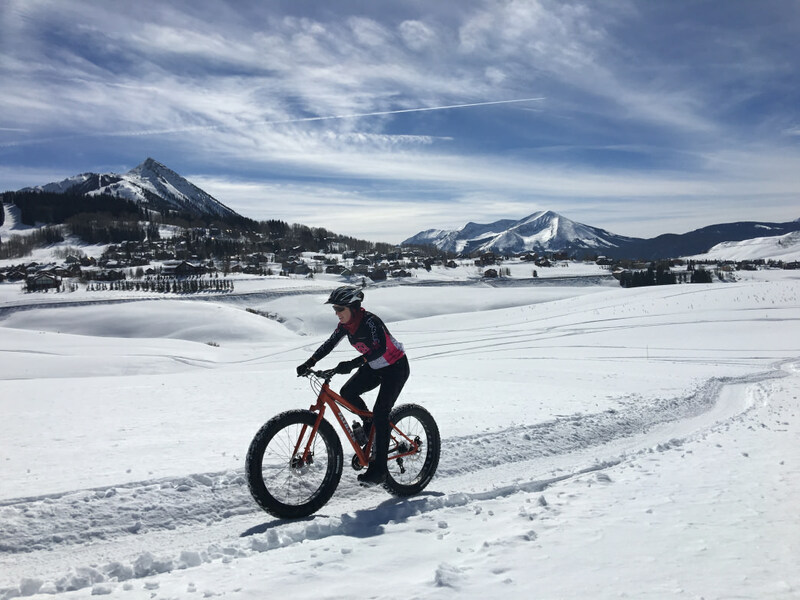 It’s easy to see that Crested Butte takes its fat biking seriously and is clearly looking to become THE winter fat bike destination of the world. In fact, Crested Butte is the proud home of the Fat Bike World Championships. Now in its third year, it takes place in January. Several hundred people enjoy a weekend of racing, demos, beer, food, and even lift-served fat biking! Let’s not forget about Gunnison! 2018 stands to be a landmark year for the fat biking scene in the valley. Gunnison Trails, with support from the Gunnison-Crested Butte Tourism Association, has purchased a Trail Tamer grooming machine to create and maintain single-track trails at Hartman Rocks. In April 2017, the BLM agreed to allow groomed runs on over 25 miles of terrain at Hartman Rocks, opening up a new world of winter riding. For those looking for a casual or introductory experience, the Van Tuyl area will also have groomed fat bike trails. This area is flat but easily accessible from town, offers excellent views of the foothills that frame Gunnison, and is family-friendly. Tomichi Cycles is one of four bike shops in town that can help with rentals and advice on trails conditions and riding options. All of this proves that there is never a bad time to visit Crested Butte and the Gunnison Valley. Visit in the winter and be treated to epic riding with stunning views. Dress warm, hydrate properly, and have fun out there! Originally written by RootsRated for Crested Butte & the Gunnison Valley | The Home of Mountain Biking.